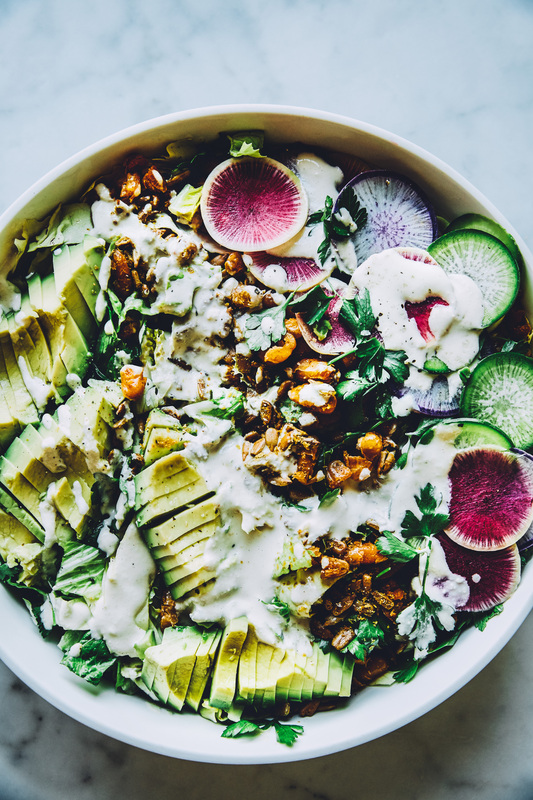 The Passion-ate Cobb is my plant-based version of the famous salad, which traditionally consists of chicken, bacon, Roquefort, avocado, and tomatoes. My salad is quite different but it’s inspired by the cobb’s cheesy, smoky, and creamy flavours using delicious plant-based ingredients. For instance, sunflower seeds roasted with nutritional yeast add a cheesy flavour, and cannellini beans baked with maple syrup and smoked paprika replace the bacon. A creamy tahini and cashew dressing is inspired by a buttermilk dressing, sometimes paired with the popular salad. The salad requires more prep than usual but trust me, it’s worth the effort. This is the kind of salad that can be enjoyed as an entrée because of its nutritious and satisfying ingredients. I was fortunate enough to shoot a couple photos for my blog, including this week’s recipe, with the very talented photographers, Alyssa and Chris of Suech and Beck. I met both of them while I was working in food styling in Toronto. They take stunning photos so I was really excited to have the opportunity to work with them. You can check their page out here. 2 heads romaine, chopped 1/2"
1 head raddichio, chopped 1/2"
In a large bowl, combine all salad ingredients. Toss with enough dressing to coast, and season with salt and pepper. Serve immediately. Rinse and drain the beans and pat dry. Stir together the beans, maple syrup, smoked paprika, salt and olive oil. Transfer to baking sheet and bake until golden and crispy, 30-40 minutes. Serve warm with salad. Blend together all of the ingredients using a high-speed blender, food processor, or immersion blender. Season to taste. ** Soak cashew in boiling water for 1 hour. Rinse and drain. This entry was posted in Salads and tagged avocado, beans, cashew dressing, cobb salad, radish, salad, seeds, tahini, Vegan, vegan bacon, watermelon radish. Bookmark the permalink.